Doula UK requires all our members to achieve and maintain standards of Philosophy, Conduct and Behaviour. This procedure sets out the action which will be taken in the event of an accusation or act of non-compliance with Doula UK policies, rules or standards and where behaviour or conduct is not appropriate. This procedure applies to all members, course providers, course facilitators and the Leadership Team of Doula UK. Our aim is to ensure consistent and fair treatment for all. 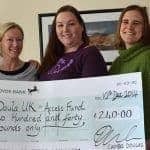 Doula UK recommends that all doulas keep written records of all work and may not be able to fully support the doula in the event of a complaint if they do not. It is always acknowledged that there are two sides to every story and no action will be taken before a thorough investigation has been implemented. Any individual or organisation wishing to give feedback or make a complaint about a Doula UK doula should email feedback@doula.org.uk​. Internal complaints may be submitted anonymously in the case of a member to member complaint if wished. Any complaint involving an external party must be submitted ‘on the record’. This is because details of the complaint will need to be supplied in order for the respective parties to address, and answer to, the issue/s. Read the Doula UK Complaints Procedure and Flow Chart in full.